Well here we go. Finally got a few snaps of the giveaway. 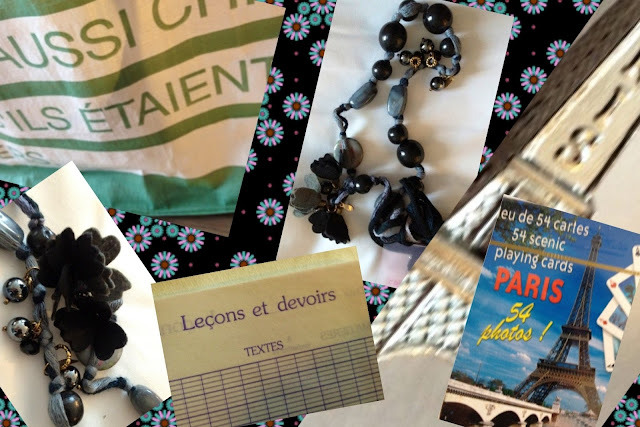 There is a super cute necklace that almost looks handmade, a pack of cards that has different French scenes, a little Eiffel Tower, a reusable shopping bag from monoprix, and also a French date book to keep yourself organized. I am still shopping around, and you can certainly bet that there will be candy in the bag as well. Make sure and sign yourself up for the blog and then leave a comment to double your chances. Much love little birds.